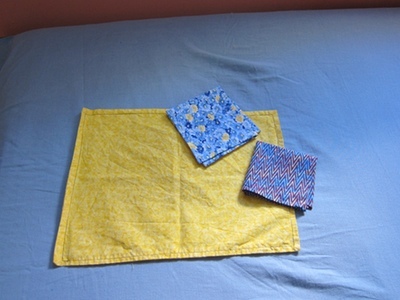 Placemats and napkins. Katherine needs to take a placemat and napkin to school with her lunch each day, and having just received my first sewing machine as a birthday gift, I thought this would be the perfect get-to-know-my-new-sewing-machine project. Growing up, I occasionally used my mom's sewing machine in random bursts of creative energy, but was always discouraged by the final outcome - usually due to crooked lines and pieces of carefully measured cloth that didn't match up. Not much has changed. I would call my decision to make the placemats/napkins a random burst of creative energy, and I am definitely discouraged by the crooked lines. Luckily no one seems to care. Curtains. Aware that I own a sewing machine, but unaware of my straight line limitations, Katherine's teacher asked me to sew the curtains for the first grade classroom. I warned him about possible crookedness, but he didn't seem concerned. So I agreed... they look great folded, but they measure two inches longer in the middle of each panel and I have no idea why. They also kind of curl up at the corners, another mystery. Trail. We needed a connector trail from the yard to the main trail. Actually, my sister and I just needed an excuse to get out the clippers and hack away at dead tree branches and drag logs through the woods. We now have a nice connector. Wood pile. Our wood for the winter (finally) arrived! Good thing I'm taking the week off so we could have a family wood stacking day. We've been looking forward to stacking wood since our early days of dreaming about life in the country. Today we were livin' the dream. I think the novelty would wear off if wood stacking day came more than once a year. Apple crisp. It didn't last long enough for a picture.